What makes Kollam Supreme different? Kollam Supreme is different because we offer you an elegant range of Traditional and Modern jewellery designs from India and abroad. We are the Manufacturer and Dealer of 1 gram gold plated Jewellery. Where is Kollam Supreme located? Kollam Supreme is located all over Kerala and the Middle East. Kollam Supreme's Head Office is at Trivandrum, Kerala, India. Do you have stores? Can I visit you to see the jewellery? Kollam Supreme has 30 shops across Kerala and the Middle East. You can visit any shop to see or purchase the jewellery. Where is your Jewellery made? We offer discounts on some selected products which is displayed on our offer page. The MRP displayed on each product is the final rate. We do not offer any additional discounts. How do I make a payment for a Kollam Supreme purchase? Kollam Supreme offers multiple methods of payments for your order: Credit Card & Debit Card, Net Banking, Wallets, UPI and Paypal. All Credit/Debit card details remain confidential and private. Kollam Supreme and our trusted payment gateways use SSL encryption technology to protect your card information. How to Place a COD Order? After adding items to your shopping cart and clicking "Proceed to checkout" from the cart page; you will have to choose the payment method you like to use to pay for your order. When prompted, select pay by "Cash on Delivery", and proceed. You will have an opportunity to review your order before confirming. Click "I confirm my order". Once your shipment is delivered to you, you will be required to make a cash payment to the Courier. The total price mentioned on the product page next to the photograph is the final price of the product and extra shipping charges are applicable for outside India. Select your piece of Jewellery and 'Add to your Cart'. Click on 'Buy Now' if you have finalized your order, else 'Continue Shopping'. Enter your Email Address and Name on the Secure Checkout Screen and proceed for 'Billing and Shipping'. Enter your shipping details and continue to the 'Payment Options'. Select your 'Mode of Payment' and 'Place the order'. You will receive an order confirmation email to the e-mail you provided while placing your order. Yes. Your order confirmation will be sent to the e-mail you provide while placing your order. Please log in to your kollamsupremeonline.com account and track your order in the "Order History" section of your account. What do you mean by 1 gm Jewellery? 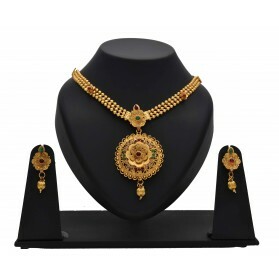 The Term One Gram Jewellery is a product name for 24 K Gold layered Ornaments. 24 K gold is being coated on metal ornaments like Brass, Copper or Silver alloy. All the One gram ornaments do not contain 1 gm quantity Gold. 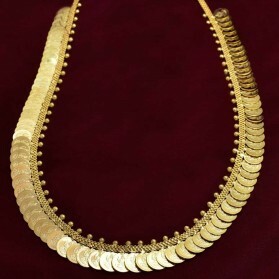 This amount gold contained in each ornament depends on its size, fashion and the price of the product sold. The One gram Ornaments are made in the same process as used in making original Gold ornaments, the only difference is in the metal used. The ornaments are lighter in weight and unlike artificial jewellery look similar in finish to regular gold ornaments. Can we daily use it? Yes, You can use it daily. If you keep them clean and dry after each use it will last for a long period. After use wash the ornaments with mild soap. Avoid over exposure to sweat and water content. 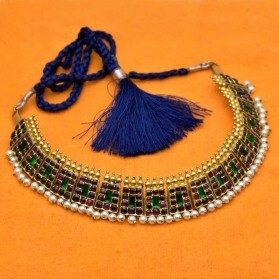 Do you have low-cost Item other than One gram Jewellery in this site? Yes, we have. We have low gold content machine formed jewellery at a lower price. They are 1/4 to 1/2 gm ornaments which are long lasting. And also we have other Fashion Jewellery, Dance Jewellery, Stone, Coral, Pearl etc. What is the Metal content of 1 gram Jewellery? The one gram gold jewellery is made from different metals like Copper, Brass and Silver Mix. What does Gold Plated jewellery mean? Gold Plated jewellery is jewellery made of a base metal like copper, brass or silver that has a layer of gold applied on the surface. 24K Gold Plated means the plating layer is 24 K gold. Will Gold Plated Jewellery fade? Standard gold plating is usually about 0.5 micron to 1 micron plating that lasts a long time depending on how the jewellery is maintained. The amount of time it takes the gold plating to wear off is dependent on the jewellery, the type of plating, and how it’s worn. The layer of gold that is plated over another metal eventually wears off, exposing the underlying metal. Are all the pearls original in quality? Natural Pearls are available like Hyderabad Pearls. But all pearls are not natural, others are semi-precious. The semi precious pearls used in these ornaments are used in the original gold-making also. With what metal are Statues in this site made up of? Statues are made of Brass, Copper and Fibre. Can I return a product if I don't like it? Will you refund the amount? If the product sent is different from what is explained and shown in the picture then it's possible. In other cases, we don't take returns or exchange like that. Photographs are not scaled to size and for this reason, all the products are explained clearly with dimensions and clear pictures. Kollam Supreme can give assurance that the products will be exactly as shown in picture and description. But the colour accuracy may slightly vary from the picture because of quality settings of different monitors and displays. Customers are advised to check the product description and pictures and if they are not sure how these products will suit their requirements, they can send us a mail or call us on our customer care no. before placing an order. Customers are also welcome to visit our shops across Kerala and the Middle East to check the product in person. If the Items I have bought from you are big for me. Can you exchange for some other products? We can take returns if the product sent is not as shown in the picture and not as per dimensions mentioned in the description. In other cases, not possible. Each product has a description with product dimensions. Customers are requested to use a scale to guess the exact size of the items using the dimensions we have provided. If the customers have doubt, they can mail us for help before placing an order. 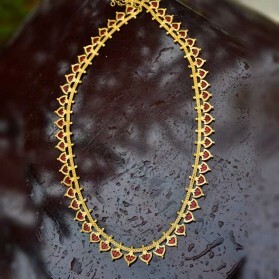 Is Jewellery sold by kollamsupremeonline.com have any Guarantee? At our offline shops, Gold Plated Jewellery carry 6- 8 months guarantee and One gram Jewellery have one year service and one-time replacement guarantee. We always offer you quality products at a reasonable price online. But we Cannot offer the guarantee for online Jewellery. 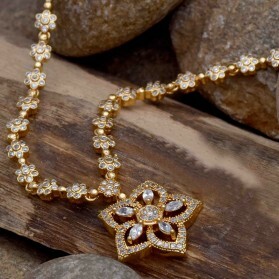 Because for the online customers it is not feasible to return the used Jewellery to get Guarantee. The big reason for it is the distance of the locations, logistic hassles and payment process viability. But we are giving the online customers a flat 30% discount as non-guarantee Products. This discount is only for that Jewellery which sold in our shops as guaranteed jewellery, which is categorized under "Gold Plated Jewellery "and "Premium Gold Plated Jewellery". All other artificial Jewellery has no guarantee offline or online. The supplementary material like American diamond or other Semi precious stone, Polki, Pearls, Crystals etc. also does not have any guarantee. My amount is debited and I have not received any confirmation mail? This may happen in two circumstances. One is wrong email id and other is network issues. Wrong email id issue can be fixed by sending us a mail from correct email id about order confirmation. In the case of amount debited without order confirmation due to network issues or because of card issuing bank taking too much time to respond etc., the amount will be automatically refunded. In case the amount is not refunded, then customers can contact us so that we can get it done by coordinating with our payment gateway bank. The payments which are debited without order confirmation will be automatically refunded and the time taken to reflect in the account of the customer may be 7 to 10 working days. But customers are requested to send a mail to[email protected] if they have received no confirmation mail after the payment. How secure is your website for using my card? We can very well assure you that our site is more secure than any other website as regards payment. This is because Kollam Supreme One Gram Designer Jewellery never accepts any card details and never stores any card information. After reviewing order, while customers click the payment button, they are automatically taken to a secure HTTPS website. It's a direct bank payment page. Only after confirming the payment, customers will be redirected again to the kollamsupremeonline website. In a way, we do not know which card you are using at all. Are mix and match available for Necklace Set? The products are combined with matching earrings only. It's not possible to mix and match between earrings shown in one necklace set with earrings shown in other necklace sets. I don't have a credit card, debit card or any kind of online payment method. How do I buy? Online payment is convenient and makes the process of order processing and shipping faster. But in certain cases, if this is not possible, You can select "Bankwire option" on the checkout page. Then you will get a mail with Bank details for payment. If you facing any difficulty, then please send us a mail to [email protected] with your product requirements and full shipping address with working phone numbers. Once we receive a mail, we can update you with bank details for payment. We don't make custom designs. But if the design you have is already available with us we can make it. I am planning to buy in bulk. Please send me your price list with wholesale prices? If customers need to buy in bulk, then they are required to mail us with their proper details regarding showroom if any, business experience, allied products etc. and also a complete list of item numbers with quantity required in each design. Our marketing team will contact you after reviewing the information. Are returns free of cost? Yes, we don't charge for returns except for the return shipping charges. Guaranteed money back. Kindly ensure the returns are made within 7 days of receiving the products. 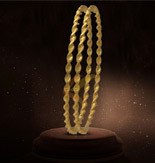 How do I return the product(s) back to Kollam Supreme Premium Fashion Jewellery? Email at [email protected] with your order number and item code you wish to return. Kindly keep it packed the way it came. Email us once you have handed the parcel to the courier person. We will notify you by email once we've received and processed the returned item(s). All items will be inspected upon return. Can I return just a part of my order? How long before I receive Refund for returned items? Kindly give us 7 working days from the receipt of your returned item(s) for us to process the return or refund. How Can I cancel an order that I have placed? Your order can be canceled only within 1 hour of placing the order. No order can be canceled as we start processing the order. Please write to us at [email protected] with reasons for canceling an order, So we can understand and improve. What are Cancellation and Refund Polices? If the payment is made using a credit/debit card (or any form of net banking) then the amount is credited back to the same account from which the payment was made. Where do all we deliver? We will deliver anywhere in India and abroad. How long does the product take to reach us? Standard shipping will take approximately 2-7 business days to arrive (Including 1 day for processing). Your tracking number will be sent automatically through a confirmation email and SMS and may take 24 hours to update. How should I protect my jewelry? If your jewelry is not used frequently, keep it away from excessive exposure to air by storing in an airtight container when not in use, a zip lock bag would be ideal. Good storage boxes are lined with tarnish-proof fabric and have a separate space for each individual piece. Avoid contact with rubber bands or other rubber products. The sulphur in rubber causes tarnishing and corrosion. Always remove your jewellery when applying scent, lotions and perfume. It is best to put your jewellery on last when getting dressed to avoid chemical contact. Never wear your gold plated jewelry in the shower or when swimming. Chlorine, especially at high temperatures, can permanently damage or discolour your gold plated jewellery. Gently clean your jewelry with a soft polishing cloth. Be sure not to over-polish jewellery, it can damage the finish.